Vintage jewelry and antique jewelry is often of timeless, unsurpassed beauty and on occasion it can be whimsical in nature, but most of all it is unique. It is a piece of history and many times leaves us to ponder the lifetime of its previous owners. It is these extraordinary characteristics that have attracted many of us to vintage and antique jewelry, along with exceptional quality that endures the test of time. 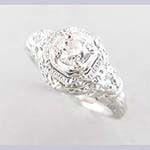 It is the best of these glorious treasures that we have diligently hand-selected to satisfy almost any jewelry desire. 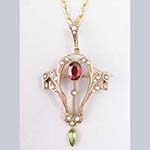 Our diverse vintage and antique collection at Jennifer Lynn's Timeless Jewelry, includes quality Victorian, Edwardian, Art Nouveau, Art Deco, Retro Modern, and Arts & Crafts jewelry. There are many luxurious unsigned jewels to choose from as well as marvelous vintage costume and sterling silver jewelry from distinguished designers, manufacturers and artists such as McClelland Barclay, Carmen Beckmann, Bogoff, Boucher, CoroCraft, Ciner, Danecraft, DeRosa, Dior, Eisenberg, Theodor Fahrner, Haskell, Hobé, Hollycraft, Jensen, Kramer, Krementz, Ledesma, Pennino, Regency, Reja, Schreiner, Trifari, Unger Brothers, Victoria, Weiss, and many more. As you embark on your jewelry journey, please remember to let us know if you do not find exactly what you are seeking. Because our vintage and antique jewelry inventory frequently changes, that very item may not be featured yet. Besides, we would love to hear from you. Cut steel jewelry and adornments have a beauty all of their own and the appreciation for these spectacular pieces continues to grow in the collectible market. Cut steel flourished towards the end of the 18th century into the early 19th century. The sparkle, shine and glimmer of the highly polished faceted steel are what made these jewels so popular. 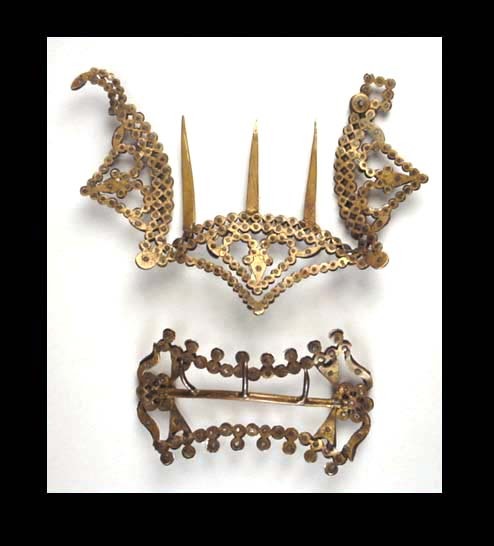 Cut steel was used in shoe clips, buckles, bracelets, necklaces, earrings, brooches, chatelaines and hair combs. 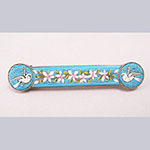 Most commonly found today are the shoe clips and buckles. These pieces are sometimes mistaken for marcasite which is iron pyrite. 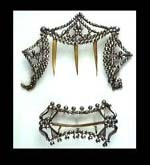 Unlike marcasite jewelry, cut steel studs are attached by rivets. These rivets can be seen on the back. Marcasites are mostly glued or bead set usually in silver or sterling silver. Cut steel is not marked and no advertisements or trade catalogs have been found so dating can be imprecise. Comparison to other fashion trends and styles during a period of time can sometimes provide a clue as to when a piece was made.